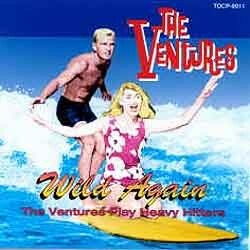 ~ 1997 CD (with extras: US) Wild Again! Here as elsewhere it’s a case of the conventional (Shadows) vs the unconventional (Ventures). 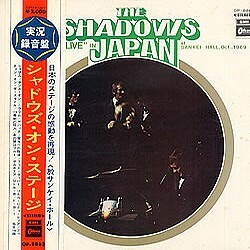 The Shadows with Alan Hawkshaw, to their understandable consternation, were captured for posterity playing this on their staggeringly poor album Live In Japan, which had one or two passable moments though the horribly stiff ‘Exodus’ was definitely not one of them, its only claim to attention being its uniqueness in the group’s recorded corpus. 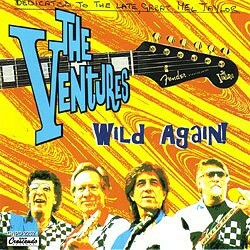 Years later, The Ventures would approach it in a wholly different way, breathing the spark of life into a rather grandiloquent-sounding theme tune by taking it at a fair lick with a deep, resonant lead guitar line from Bob Bogle against that attractive chugging background popular with them around this period; there is a Ferrante and Teicher-style interlude, but the piano does not sound too grand, being carried along in fine style with the rest. There was a return visit with a more dynamic, thrusting workout on the 2003 CD (Japan) Your Hit Parade 60’s (see entry ), this time with Nokie Edwards on lead. He puts in a characteristically swaggering performance marked by some nice tonal variations and an improvising spell which puts paid at a stroke to any suspicion of a band raking over stuffy old material; add to that an organ break, all the more effective for being brief, and some great drumming from Leon Taylor. A winner.